With grown children having other family and work commitments, we celebrated our Thanksgiving blessings on Friday. 1. Both my mother-in-law, Grandma Sugar, 84, and my mother, Mamaw Carpenter, 90, were able to join us. We are so blessed that our grandchildren have opportunities to stay close to these really GREAT great-grandmothers. 2. With everyone having experienced multiple turkey dinners, our Thanksgiving feast was baby back ribs and traditional sides, thanks to my husband Walter. 3. Son Jeremy had the courage to marshal our grandchildren ages 7, 5, 3, 21 months and 17 months for decorating duty. He festooned our Christmas tree with garlanding then he and I helped the children decorate. The ornaments were all ones our sons had made or that we or others had given them each Christmas of their growing up years. It was not an exercise for the faint of heart or the dedicated perfectionist. But it was perfect. 4. When daughters-in-law Sarah and Katie get together, the conversation is nonstop with their catching up, comparing notes, swapping ideas and keeping kids engaged and happy. What a blessing they are individually and collectively! A November visit to Callaway Gardens in Pine Mountain, GA, is not complete for me without checking out the dazzling holiday displays of living plants at the John A. Sibley Horticultural Center. We spent a couple mid-morning hours there in a delightful detour from our route to Savannah, GA.
An unexpected but inspiring discovery was a container filled with an unidentified bromeliad exactly like one given to me by Walter’s Aunt Genevieve Cowan several years ago. She had described the blooms I could expect in the fall, but I was still astounded with the vibrant combination of colors. I took the photo above intending to ask one of the volunteers to identify the plant. With the distraction of all the other plant displays and the garden gift shop, I failed to tap into their expertise. I was inspired, however, to search the Web for the plant’s identity and hints for care. My plant is not as healthy looking or as full of blooms as the Callaway version. The North Florida Garden Guide provided the best information I found. It described the plant as an easy-to-grow bromeliad native to Brazil, Argentina and Uruguay; scientific name Billbergia nutans, also known as Queen's tears bromeliad. But “friendship plant” is the common name that best fits the source of my plant, Aunt Genevieve Cowan. She passed away last year. She was a trailblazer as a nurse and an educator of nurses on the Mississippi Gulf Coast. She never met a stranger. Her far-flung network of friends and of people and organizations she helped spanned the Gulf Coast and beyond. My friendship plant is a daily reminder of the good times and good example she gave our family. I photographed several of the center’s other displays of holiday flowers and foliage that I enjoyed before my camera battery drained dry and quit. Chrysanthemums and coral bells graced the entry of the center. White Christmas-cactus blooms look fragile and fairy-like. Poinsettias are among my favorites for inducing Christmas euphoria. As part of the Sibley Center’s 25th anniversary celebration during 2009, especially commissioned picture frames of living plants showcase outstanding topiary and floral displays featured at the center through the past 25 years. The Sibley Center Web site notes that the frames are planted with succulents, ivy, and/or tillandsia, which I learned from other sites, are air plants, taking their nutrients from the air. My favorite topiaries, though were the teddy bear and toy train, pictured below. A visit to the Christmas lighting extravaganza at Callaway Gardens in Pine Mountain, GA, is becoming a tradition for my husband Walter and me. On Saturday evening, Nov. 21, our eldest son, Walt, and family piled into our van with us and headed to Fantasy in Lights, five miles of fantastic lighted scenes. Four-year-old Nate, left, and seven-year-old Luke were happy to have their mom Sarah squeezed in between their car seats in the back of the van. Walt had brought a stack of Christmas CDs, so we started getting in the spirit immediately. Walter and I first experienced Callaway Gardens’ Christmas lights in 2007 when we joined the annual March of Dimes Walk – the one night that is reserved each year for walkers only, no vehicles allowed! We introduced Walt, Sarah and kids via the trolley ride in 2008. Walter – Baboo to our grandchildren – took this photo of our 2009 trek from parking lot to the entry. We opted for the 6 p.m. “Jolly Trolley” ride although driving your own vehicle is an option. Our son herded Luke and Nate into the front row of the trolley. As the trolley carried us through the fanciful exhibits, the excited boys vied with each other to identify individual lighted and moving elements. We rode through Santa’s workshop, critters of forest, meadow and pond, Jack Frost’s winter scenery and more. The youngsters were oblivious to the trolley full of people behind them and the chuckles that greeted their enthusiastic, and loud, commentary. But the chuckles turned to outright laughter at their gleeful announcement in a dark stretch between exhibits: “Here comes the haunted house. Get ready for the haunted house!” Their dad clued them in on why they were unlikely to experience a haunted house in Callaway Gardens’ Fantasy in Lights. Taken with my point-and-shoot Canon, this was my first and last attempt at capturing the wonder of the exhibits. The jiggle of the trolley is evident, but this photo still makes me smile about our evening in magical lights. Walter had a little more success. Two of his photos are below. When my mother moved to Provisions Living retirement community in Hattiesburg, MS, she brought a single newspaper clipping from among the many inspirational articles and quotations she had saved over the years. As I typed the words from the yellowed and worn newsprint, I wondered if she had saved it especially for me. I recognized the change that aging is bringing to my behavior. Here is “A Personal Prayer” that I need to make my own. The newspaper and source were not identified. Lord, you know I am growing older. Keep me from becoming talkative and possessed with the idea that I must express myself on every subject. Release me from the craving to straighten out everyone’s affairs. Keep me from the recital of endless detail. Give me strength to get to the point. Seal my lips when I am inclined to tell of my aches and pains. They are increasing with the passing of years, and the love to speak of them grows sweeter as time goes by. Teach me the glorious lesson that occasionally I may be wrong. Make me thoughtful, but not nosy. Helpful, but not bossy. With my vast store of wisdom and experiences, it does seem a pity not to use it at all. But you know, Lord, that I want a few friends in the end. A benefit of grandparenting is that grandchildren are an unending source of enjoyment in multiple layers. When my husband and I visited with our oldest son’s family recently in Columbus, GA, grandson Nate was eager to demonstrate his new skill of riding his bike sans training wheels. I shared his excitement, and his pride and pleasure conjured up memories of his dad’s determination to learn to ride a bike and of my own childhood biking adventures. Nate’s sheer joy in the newfound freedom of speed came in second only to the thrill of rocketing down the steep driveway of the Skupien homestead. Actually, I set a limit on the driveway maneuvers. Knees and other parts of Nate’s anatomy were healing up from earlier encounters with concrete during his extensive “practice” while mastering the bicycle. On my watch he could launch from about one-third of the way up the driveway. This grandmother can take only so much excitement, and I was not eager to be a party to additional skin loss. My own biking experience started indoors at age six. Ecstatic with a new green and white bike for Christmas, I was diagnosed with mumps before I could even get that bike out the door. I spent the entire Christmas vacation inside, much of it sitting on my new bike in my bedroom. But never, either then or in later years, have I ever come close to granddaughter Charlie in biking fashion. Three-year-old (almost four) Charlie wanted to join Nate in the bike-riding activity. She was barefoot and dressed in her Cinderella costume and a string of pearls. “No shoes, no ride,” I ruled. She came back out with bejeweled flip flops on. When I explained that she must have shoes with closed toes and backs, she pointed out that such shoes did not go with her costume. I was adamant. “Oh, all right. I’ll change,” she finally relented in a decidedly 13-year-old tone. She returned with her athletic shoes on and the costume off. But she kept her pearls on and added a chapeau. Charlie is serious about accessorizing. One of my favorite blogs to follow is The Daily Skup. No wonder. The star is our granddaughter Molly Kate. Our daughter-in-law Katie blogs about motherhood and Molly Kate’s adventures illustrated with abundant images that she and our son Jeremy capture. They recently announced to the world via Facebook and a “Coming Soon” post on the blog that their family of three will expand by one in May. Grandbaby #6 is on the way! I really don’t like whatever character trait it is that keeps me coasting along in a little niche and ignoring the glue of relationships (and I don’t want to go there and examine that right now, thank you). But I do appreciate the effort and generosity of others who are willing to apply some fresh new glue. 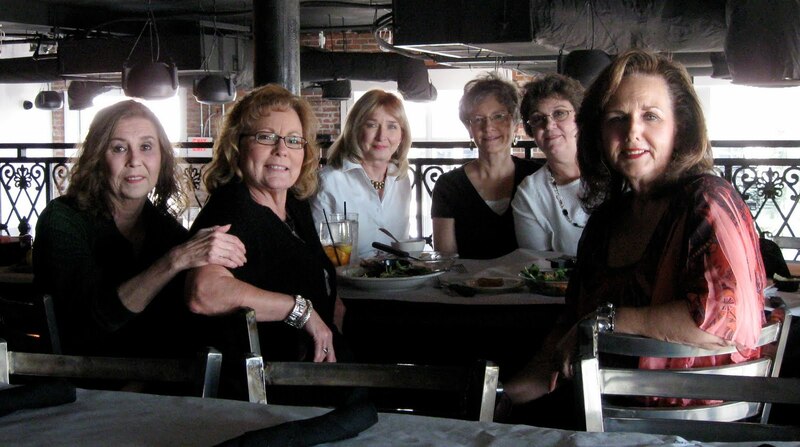 Saturday, Nov. 14, six ladies who are 1965 graduates of Hattiesburg High School met at the Half Shell Oyster House in Gulfport for lunch. All six of us graduated high school together. Five us went to Camp Elementary School together, and the sixth one grew up in the same church with me. Until Saturday, I had lost touch with all of them, but thank goodness, they are true glue girls. Lunch was a feast of laughter and catching up. A bonus was that my sometimes undependable recall wasn’t an issue (names are the worst). During the “Do you remember this classmate and where are they now?” catching up, what one person didn’t remember, someone else did. What a treat! From the left are Mary Mathis Thompson, Barbara Dee Buchanan Graham, Pamela West Randall, Linda Carpenter Skupien, Susan Archer Lanham and Charlotte Calhoun Hurt. Like my mother-in-law, Grandma Sugar, I don’t have one favorite Bible verse. At different stages of my life – or even on different days – specific verses have filled a need, prepped me for a challenge, applied a jolt of joy, given me spiritual food for thought and even tickled my funny bone. In my early teens, though, Romans 12:1-2 was my favorite scripture. That passage took me through high school and into college. I experienced my share of teen angst and often felt like the oddball. But I was convinced that those verses were a roadmap God gave me for making moral choices. I could trust God to take care of my present and future. And he did. Meeting the challenges of daily living was another matter. In the early years of marriage, raising a family and working, I continued my tendency of frequently becoming overwhelmed by circumstances, deadlines and just the challenges of living. It was not that I did not have faith; I just didn’t know how to exercise it. Growth in that area of the Christian walk first began to change thanks to Betty Milsted, bureau chief and fellow reporter at the Ocean Springs office of the Mississippi Press daily newspaper where I worked from about 1973 to 1977. She loaned me books about prayer and mentored me. The big message was that faith is not a feeling, but an act of will. I learned that turning from my negative -- and intensely physical – feelings, even for a moment, was exercising faith, trusting God. 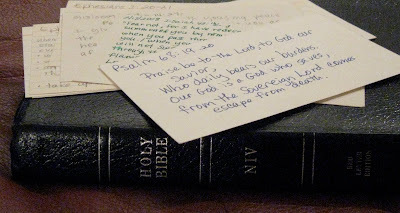 I began jotting down verses and quotations that reminded me how to exercise faith, each one on a separate 3x5 index card or any handy scrap of paper. Those cards helped when feelings of panic, anger or resentment would start in my stomach and surge through me. I could not even summon the simplest verse or prayer that applied to those situations, but I could reach into my pocket, pull out a card and read what I had written earlier. It worked for me. There were other individuals, especially my husband Walter, who helped me along the way to abandon crisis thinking and keep things in perspective. Nowadays I still have the habit of writing verses and thoughts on index cards. But now they serve a different purpose. Those verses I carry around provide a deep sense of wonder or joy. The combination of cool temperatures and plenty of sunshine mandated a bike ride to Ocean Springs’ East Beach this morning. The 10-minute ride to the beach always involves some huffing and puffing on my part and makes me feel satisfied that aerobic exercise can be checked off the to-do list. The sun was shining with that November angle, right into the eyes. 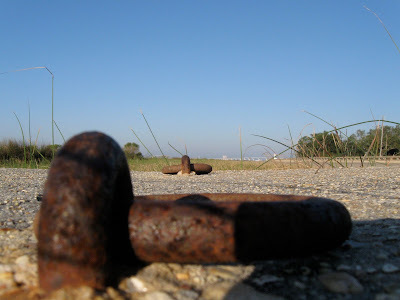 But it also bathed everything in a wonderful glow, giving even the hardware on cement drains at the beach an interesting patina. 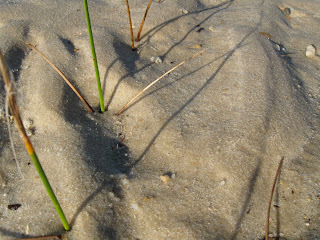 The sun sparkled on the ripples left in damp sand, Hurricane Ida’s footprint on East Beach. 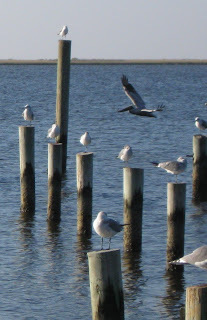 Sea gulls and brown pelicans were enjoying the sunshine, too; and I enjoyed them. Another unexpected pleasure was an introduction to Lulu and her human companion, Martha Thompson. 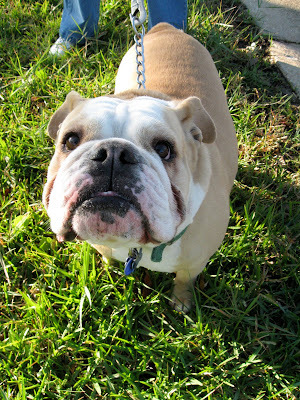 Lulu, with a coat the color of café au lait, seemed quite unaware that she is an English bulldog. An intrepid explorer, she was carefully checking out everything new that came her way during her walk, including my camera. Starting a family and starting retirement occurred decades apart for me, but both involved an examination of priorities and values, taking a hard look at finances in tight times, and lots of love. If my husband and I had worried about all the things that could happen back then, we would never have started our family. Same for retirement. We had prepared the best we could and finally just took a leap of faith. I set the date to turn in my public information officer’s hat at the Gulf Coast Research Laboratory. The Lab in Ocean Springs is part of the University of Southern Mississippi and both were home to colleagues who made every day an adventure in the best sense of the word. Three things fueled my growing interest in retiring from a job I loved -- the desire to travel with my husband Walter, to be a part of our grandchildren’s lives while they are little, and to spend more time with our aging mothers. Those top three were not my only incentives to consider retirement before 65. My retirement to-do list is extra long with lots of other want-to-do and should-do things that I had put off for ages. I started praying about if I should retire and if so, when. Walter and I discussed expectations, finances, the possible effects of changes in routines, and dozens of other questions and issues that occurred to one or the other of us. A sense of urgency developed from the conviction that the current moment is the only sure opportunity for special times with those I love. The decision-making process took about 16 months. My last day was April 30, 2008. • completed a June 1-30 van trip out west. To a query about what I was doing in retirement, I ticked off that list and ended it with “My cup runneth over.” The comeback was “It sounds more like your cup runneth over you.” Not quite, but the pace has been a bit more leisurely since then. For more than a decade, beginning in 1997, I spent the first weekend in November at the Gulf Coast Research Laboratory’s booth at the Peter Anderson Arts and Crafts Festival in Ocean Springs. It was great fun being part of the Lab team of staff, students and volunteers sharing the wonder of live coastal animals and helping youngsters mix art and science. Retirement has personalized my focus. My husband Walter and I scoped out the booths early Saturday. Our plan was to meet our oldest son Walt and our daughter-in-law Sarah then take our four grandchildren home with us. We could enjoy a few hours of energetic grandparenting and give mom and dad some time sans kids for immersing themselves in the Peter Anderson art smorgasbord and contributing to the Ocean Springs economy. A balloon, music and crowds entertained youngest granddaughter, 17-month-old Stella, above, while we waited in the shade for her siblings to select hand-crafted toys from a vendor on Government Street. Her sister, 3-year-old Charlie, concentrated on watercoloring at the Gulf Coast Research Lab booth. After a hike to connect with our transportation, four tired and two re-tired Skupiens rode home. Our other granddaughter, 20-month-old Molly Kate, arrived later that afternoon with her parents, Jeremy and Katie. No photos of our two seven- and five-year-old grandsons. They were too elusive, busy stalking various villains with their new bow and arrows and crossbow purchased at the festival. Walter and I closed out our Peter Anderson weekend with a late Sunday afternoon foray among the booths to purchase Louisiana satsumas and a piece of pottery by Beth Sartin, a Brandon, MS, artist. Today I visited my mother in Hattiesburg. It was just a visit, no doctors’ appointments, emergency room visits, hospital stays, consultations with home health care or dealing with a flurry of medication changes. We had shared a lot of “just visits” since she made the decision to move to a studio apartment at the Provisions Living retirement community in Hattiesburg in April. She celebrated her 90th birthday with her children, grandchildren and great-grandchildren in June at our home in Ocean Springs. With other Provisions residents who have June birthdays, she celebrated again at a cake and ice cream party at Provisions. But my favorite visits were just hanging out, laughing, reminiscing, talking about the books we were reading, sharing Scripture that was on our minds, and playing Scrabble, Skip Bo or Rummicube – which she occasionally let me win. That had changed by August when a series of falls and major physical and mental declines turned our visits into that unrelenting medical scramble of two steps forward and three steps back. One of the blessings of retirement is that I could be with her and work closely with all medical and Provisions personnel without trying to balance both a demanding job and her needs. Even during less-than-coherent weeks, her sly sense of humor cropped up along with her typical concern for, appreciation of and interest in everyone around her. The extreme low sodium that accelerated her condition is now closer to normal and Mother is feeling more herself. When I arrived at Provisions yesterday she was just finishing breakfast with friends. From the left, clockwise, are her long-time friend and fellow retired teacher Dot Kelly, new friends Wayne and Cleone Utterback, and my mother, Annette Carpenter. Our morning flew by with a little furniture rearranging, replacing a defective power strip, sharing a prayer for family members and playing Skip Bo. Then we joined more than 20 other Provisions residents for a bus ride to the grand opening of GattiTown. The new pizza eatery treated the residents to the lunch buffet and an opportunity to sample the challenges of the game room. Maggie Youngblood, right, serves Provision resident A. G. Welch at GattiTown. Youngblood, a New Orleans native, and Larry Keeton of Butler, AL, are completing a practicum at Provisions as part of their degree program in recreational therapy at the University of Southern Mississippi. The two students joined the Provisions resident assistants in supplying a little extra cheerful help at GattiTown. Wyona Cress, Provisions resident, is the proud mama of the GattiTown principal owner, Gary Cress. Mrs. Cress is one of a number of residents who are members of Main Street Baptist Church and who were an integral part of my growing up years in that church. A real benefit of Mother’s choice of living arrangements is that she knows so many people there. Every visit includes seeing someone who enriched my childhood. After lunch Mother and I played a couple more hands of Skip Bo, and it was time to say goodbye. Next week we will be making a followup doctor’s appointment. But for today, it was just a visit. What a blessing. The moon descending in the western sky and dawn painting the eastern sky made an early morning bike ride a great way to start the day. This blog is born out of frustration with myself for failing to regularly record the impressions of my first year of retirement. I semi-successfully applied pen to paper the first two months of my retirement, May and June 2008. Since then, I have managed, occasionally, to jot a note in my pocket calendar (again, pen and paper). I am dismayed, but not surprised, that without some written record, I fail to remember the what, when and how of my retirement journey. There is so much to be thankful for, and I don’t want to forget. Even though I may be the only one who ever sees this blog, the mere possibility that someone else may stumble across my posts will -- I hope -- keep me accountable and committed to recording observations about the blessings, experiences, challenges and issues during this stage of life.